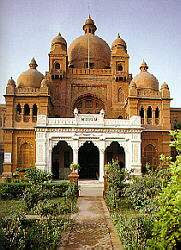 Opposite the old University Hall, a Mughal style building on the Shahrah-e-Quaid-e-Azam, houses the Lahore Museum. the Museum contains some fine specimens of Mughal and Sikh door-ways and wood-work and has a big collection of paintings dating back to Indo-Pakistan, Mughal, Sikh and British times. It has also a collection of musical instruments, ancient jewellery, textile, pottery and armoury. There are also relics from the Graeco-Pactrian times as well as some Tibetan and Nepalese exhibits.